I am blessed with a lot of geek-tastic friends. Geek-tastic friends who go above and beyond when I ask them to do things. My buddy, Tris Hussey (who is the author of, among other books, Create Your Own Blog: 6 Easy Projects to Start Blogging Like a Pro) was in the market for a new laptop bag. I suggested that he come peruse my review copy stash - and if he saw something he was keen on, he'd take it for a test drive and keep it if he liked it - and do a little review. Now, not only did Tris do a review of the ScanFast Checkpoint Friendly Briefcase Bag 2.0 from Mobile Edge, but he did a video review AND included a comparison with some of his older bags on why he liked the new one, but what he thought Mobile Edge could do better. Even if you're not in the market for Mobile Edge specifically, Tris points out a lot of things to think about when you are shopping for a new laptop bag. The tips he shares in the video complement a recent post of his on the FutureShop.ca Tech Forum called Papa's Got a Brand New Bag - also worth a quick read if you're in the market for a new laptop bag. Thanks for the review, Tris! You know what's cool? Not getting your goods felt up by the TSA. You know what's funky? Keeping your gear protected while going through airport security. You know who has you covered? Mobile Edge. Matthew from Mobile Edge sent over a couple of their latest and greatest Checkpoint Friendly bags - a briefcase model and a backpack model. I've reviewed them both over on Squidoo. Black and sleek, this bag is function, function, function all the way. The front of the bag has four zippered pockets. There are two pockets shaped and sized for cords and power-bricks, and there is a large flat, zippered pocket for reading materials. 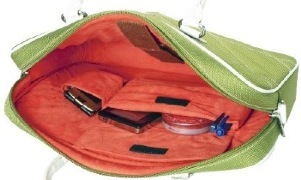 The fourth pocket is a smaller zippered pocket for quick access. I'm stashing my airline ticket and identification in there. The briefcase opens clamshell-style. One side has a built-in slot for my laptop, and the other has storage for documents and accessories. The laptop pocket is made to fit laptops with up to 16" screens. It easily fits my MacBook Pro, and it will definitely fit a PC as well. The elastic and Velcro strap firmly secured my laptop. The "Checkpoint Friendly" label on the pocket will remind TSA agents that bag is cool to go through the X-ray. It's ALL COOL, TSA. 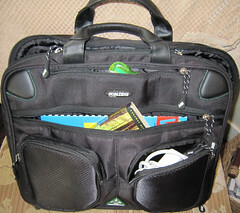 Read the full review of the ScanFast Checkpoint Friendly Briefcase Bag 2.0. Remember the cartoon Inspector Gadget? Thanks to his genius niece Penny and her dog Brain, Inspector Gadget inadvertently foiled the plans of evil Dr. Claw and his M.A.D. agents every week. I was a little in love with Penny, of course - but I was always jealous of Gadget's spring-loaded shoes, helicopter hat and hand-phone. So when I opened the ScanFast Checkpoint Friendly Backpack 2.0 from Mobile Edge, I was immediately taken with its clever design and easy access to all of my geek gadgetry. It's like an Inspector Gadget backpack - for grown-ups. Read the full review of the ScanFast Checkpoint Friendly Backpack 2.0. And don't forget, you can get 15% off any Mobile Edge bag by using the code FUNCHICO at checkout. Dum, dadda, da dum. Bum, badda, ba dum. It's spring time. I've got a bounce in my step. Easter is near. Time to throw off the shackles of winter, dear. Dum, dadda da dum .... Bum, badda, ba dummmmm. OK, so I'm not MUCH of a songwriter. But after all the snow that is hammering a fair chunk of North America, we need to be singing about something. I've been desperate to cast off my heavy winter coat. Junk my clunky boots. Trade in my big bulky laptop bag for a light-weight slim, colourful case. And Abbi has just the thing. They sent over a briefcase from their new Erin Collection to test drive and hopefully perk up my winter blahs. The Erin Collection has three great bags and is decked out in four springy colours. I tested the Erin Briefcase in "Dusty Miller". Now, like spring, I am a little fickle and slightly peevish. And I'm conflicted about the Erin Briefcase. I am DELIGHTED by its silhouette and form. It is slender and lightweight. The exterior is water-resistant nylon and the trim is patent leather. I particularly like the hardware appointments: the zipper pulls, accent rivets, rings and buckles are high-quality. However, I feel the carrying strap is a real design mis-match for the Erin Briefcase. The camel colour of the strap matches only one of the bags and the texture disconnect between the patent leather and the nylon strap (in my mind) reduces the richness of this bag. Also, the strap isn't long enough to wear the Erin across your body if you're dashing somewhere in a hurry. 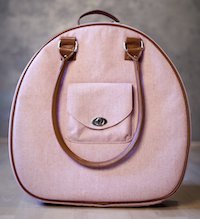 The Erin does come in a surprising colour range: cherry blossom and lime green - perfect for spring; dusty miller - for those for whom grey is the new black; and saddle brown - when you want a bag that will go with EVERYTHING! Oddly, the interior colour of the Erin Briefcase is a neon orange. It is extremely well padded and soft, but, it is *orange*. The Erin is meant for those who travel light, so there isn't a full internal compartment for your laptop - simply a strap that will keep it from banging around. There are two other pockets for cellphone, wallet, etc. There is also a pocket on the back of the Erin Briefcase that can hold your power cord, boarding pass or other sundries. I took the Erin Brief with me on a four-day trip to Toronto. It was light and comfortable to carry through the airport. However, getting through the security line quickly was difficult. The strap that holds the laptop was awkward to unfasten and pull out the laptop for inspection; it was IMPOSSIBLE to then put the laptop back in after going through the detector without pulling out everything, strapping the computer in and refilling the bag. 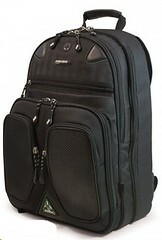 So, I cannot recommend this bag for road warriors at all. However, if you want a light, stylish bag for carrying your laptop to and from the office (particularly if you have a power cord and other accessories at each locale so you don't need to carry much), the Erin Briefcase is perfect. This is one case where it really does depend on your lifestyle and what you need from a laptop bag. The Erin Briefcase retails for $149 USD and fits laptops up to 15.4" widescreen.